Despite wearing gaiters, the dirt piled up in my shoes while on the PCT, leading to small blisters at the corner of the heel. Friction: Your skin rubbing inside your shoe; toes rubbing against each other; rocks, dirt, or grit in your shoe. Moisture: Sweaty from your feet; stepping in a stream or puddle; getting caught in the rain; falling into a body of water. Heat: Body heat generated by hiking; ambient air temperature; solar radiation. Almost all of the above are inevitable to some degree when backpacking and hiking. So avoidance is a short term strategy at best. Instead our efforts must be put toward prevention and management. This starts with choosing appropriate and correctly sized footwear. Burly mountain boots used to be quite common for all backcountry activities, but It’s much more common these days to see hikers backpacking in what look like low-top running shoes. Boots still have their applications, such as in snow, or hauling heavy loads. However, with many hikers going ultralight, pack weights don’t require heavy boots. Hikers are trading in boots for trail runners. Trail runners are the ‘mountain bike’ version of road-running and cross training shoes. Armed with aggressive, trail-ready traction, they break in like sneakers, usually requiring very little time to become totally comfortable. Trail runners typically are not waterproof. New hikers often make the mistake of thinking they need waterproof (usually GoreTex) footwear. This is not so. Even though your feet may get wet, they will also have a chance of drying. Compare this to heavier, GoreTex shoes and boots, which may wet out from your sweat on the first day of the trip and then never fully dry. Sure, you can snag a pair of waterproof trail runners, but that big hole at the top into which you slid your foot is only a 3 inches above the ground, so the claim ‘waterproof’ is highly debatable. One of the benefits of moving toward an ultralight base weight is you no longer require the structure and support of a beefy, heavy boot. It’s said in the backpacking community that 1 pound of weight on your feet is roughly equivalent to 5 lbs of weight on your back. Fitting trail runners is pretty straightforward. They’re like sneakers and should fit and feel like sneakers. Just be sure to choose a shoe with a bit of extra room in the toes so you don’t ‘bottom out’ on the downhills. Hiking boots are stiff by design so as to offer support for more gnarly and technical terrain—and while lugging heavier loads on your back. They are much harder to fit properly, and are particularly challenging for beginners. I bought three pair of expensive GoreTex boots before I realized how big I actually needed to go to account for thick socks, the swelling of the foot while hiking, and the dangers of tight boots constricting circulation, which results in perpetually cold feet. Breaking in a good boot will require much more time. Even synthetic boots take a while to mold to the shape of your anatomy. Popular aftermarket insoles, such as Superfeet, can take over a hundred miles of travel before they’re fully broken in. Once broken in, a good boot is a great choice when hauling a heavy load, or in colder, more sedentary activities. I frequently turn to boots for Winter and more technical mountain travel. However, keep in mind that with boots—especially waterproof boots, keeping them dry will be nearly impossible. Over a multi-day trip, those ‘waterproof’ GoreTex boots could end up with so much sweat inside, that you’ll swear they have a leak. Achieving the proper fit with hiking boots is challenging, and will take time and practice. You’ll need to make sure you have about a finger’s width of distance in the toes, little-to-no rubbing in the heel, and a uniform pressure around the upper covering the top side of your foot. The sole should feel moderately stiff with a bit of cushion. Put your feet in as many boots as you can. Leave them in until the boot heats up and softens. Climb on the fake rock mounds that most shops have to make sure you can go up and downhill without bashing your toes or chewing up your heels. If possible, take a fully loaded pack to see how they feel with more load. Before I knew the joys of ultralight and trail runners, I used boots and would always mistake the dampness for a potential leak. Here I am dealing with blisters int the Adirondacks. My boots wetted out with sweat on day one and never dried. Regardless what style of footwear you choose to hike in, make sure you don’t settle for an imperfect fit. There are many brands and, and finding what works for you will take time. A blister-free fit comes down to finding a perfect balance between having room for your foot to expand without having so much room that the shoe moves around causing excess friction. You probably won’t strike gold with your first purchase. But you will gain valuable experience about what works and doesn’t work for your foot. Fortunately, REI has an absurdly generous return policy. It’s usually my first stop for new footwear. I also like to buy multiple brands of shoes/boots at the same time and wear them on alternating days and hikes to evaluate them head-to-head. I find I learn a lot more about the characteristics of a shoe when I have an alternate comparison point. Keep your socks as clean and dry as possible. Merino wool and polyester are not only much safer than cotton, they’re more comfortable than cotton too. Damp or wet cotton will tear up friction points much faster than merino wool or synthetics. Choose the right thickness for the season and activity. 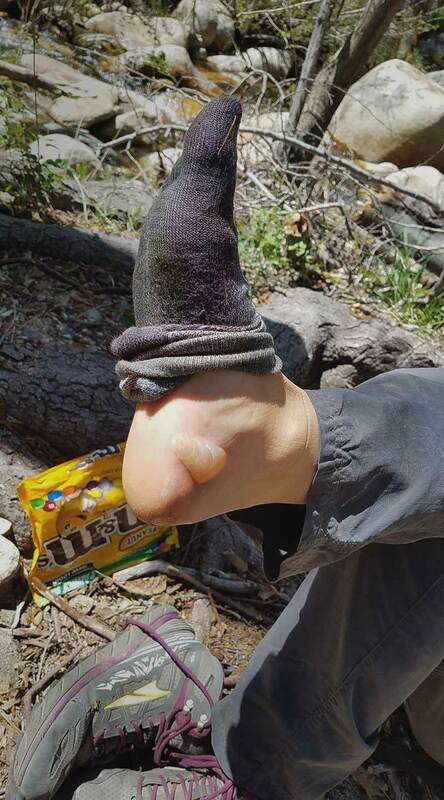 If it’s the middle of the summer and you’re day hiking, you may want to think about how much sweat a thick sock could generate. To help keep your socks dry, carry an extra pair of socks and change your them halfway through each day. The socks you wore in the morning—now damp with sweat—can dry in the afternoon sun. Chances are they could be dry by the time you arrive in camp. Thin liner socks help move the friction from between your foot and the sock to between the liner and the sock. Provided your footwear is sized correctly for your sock combination, adding a liner will go a long way to reducing blistering. There are many options available on the market from silk, to polyester with silver threads to combat the smells, to thin merino/synthetic hybrids. But a liner can simply be a thin sock of your choosing. 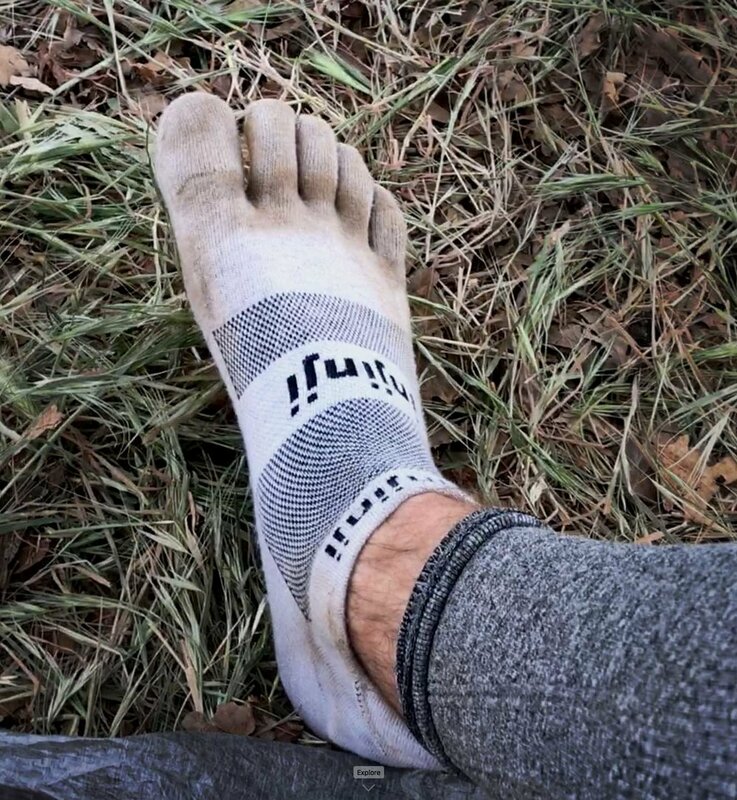 Injinji toe socks make great liners. Each toe is isolated it it’s own mini sock, helping to reduce the friction that creates hotspots and blisters between toes while hiking. Choosing footwear that fits properly is only part of the battle. Blisters form on skin that is wet and dirty. However, keeping your feet clean and dry is easier said than done. In fact, I think it’s impossible. Keeping feet clean can be a never ending task. But it is a battle worth fighting. Frequent cleanings help reduce irritants that create friction and lead to blisters. Clean your feet at end of each day or even midday with you bandana or camp towel. This helps reduce dirt and provides an opportunity to let your feet breathe and dry a bit. Switching socks midday (or more frequently) is a great way to keep your feet dry, and is a good excuse to clean them midday. Even putting your feet into dry socks and then immediately back into wet shoes helps show the progress of blisters. 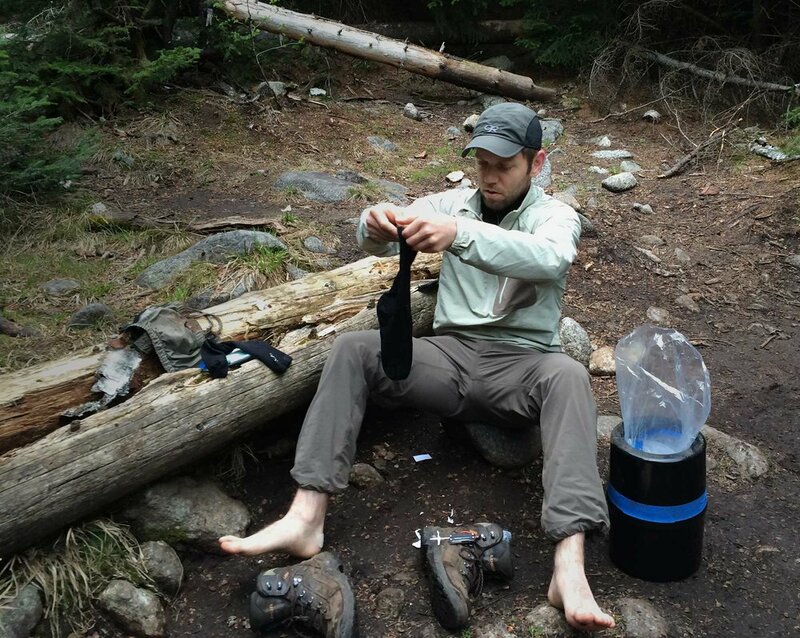 You can wring out and safety pin the damp socks to your pack so they can dry as you hike. If your socks are particularly filthy, rinsing them in streams or ponds may be necessary. NEVER use soaps or detergents—even fancy biodegradable stuff sold at REI. They’re harmful to the critters that live in water sources. I should also point out that even without soap, rinsing your socks in a water source is considered faux pas in the strictest sense of LNT. You can leverage the hand sanitizer from your toilet kit if you need to go with the “nuclear option” when cleaning your feet. Lastly, with your feet getting wet and drying repeatedly, you risk getting macerated feet—a painful condition where the skin dries out and cracks. Use a salve like Bonnie’s Balm to keep skin from getting macerated and dried out. Apply generously every night and again in morning if skin of your feet still feels dry. Walk slower. Rushing makes your form sloppy. You will increase the friction as your gate becomes less deliberate. Focus on moving efficiently and landing softly with your stride. Remove shoes and socks during breaks. This lets your feet dry out and cook down. It seems annoying and time consuming at first but is one of the best ways to prevent blisters from forming. When arriving in camp: Loosen or remove shoes. Change into your dry socks and get the damp ones busy drying. Put on clean and dry socks. Sometimes just changing socks is enough to give your skin a break from the friction that causes blisters. Avoid hiking in the hottest portion of the day. Your pace slows in the hottest part of the day (typically 12:00 to 2:00 PM). You’ll spend more time on your feet, hike fewer miles, be more exhausted and produce a lot more sweat—especially in your shoes. Take a siesta during this time and use it to clean and dry your feet. Switch socks. Rest and stretch those muscles. Your body will thank you and you’ll be ready to crush miles as soon as the temperatures begin dropping. Apply Leukotape in advance. Using a blister treatment against a known hotspot area before you hike is a great way to ensure those problem areas don’t ruin your hike. Wear a liner sock. This helps move the friction from your skin to between the liner and outer sock. I wear Injinji toe socks as my liner to decreases friction between toes as well. The liner doesn’t have to be an official liner. Any thin, lightweight wool or polyester sock could work. Experiment a bit to find the system that works best for your feet. Examine and adjust sock and shoe. Look for any recently formed issues. Is your sock bunched up? Is there dirt, or a rock in the boot that is creating friction? Is there damage to the footwear? Some of these issues can be easily fixed in the field without digging into the med kit. Clean the foot/or affected area. Wet your bandana and wipe any dirt off your foot so you can examine the affected area. Is the skin damaged? Tender? Is there already a blister? Many times just cleaning and drying the foot is all you need to fix the problem. Apply Leukotape. Mole skins are no longer the darling for blister treatment. 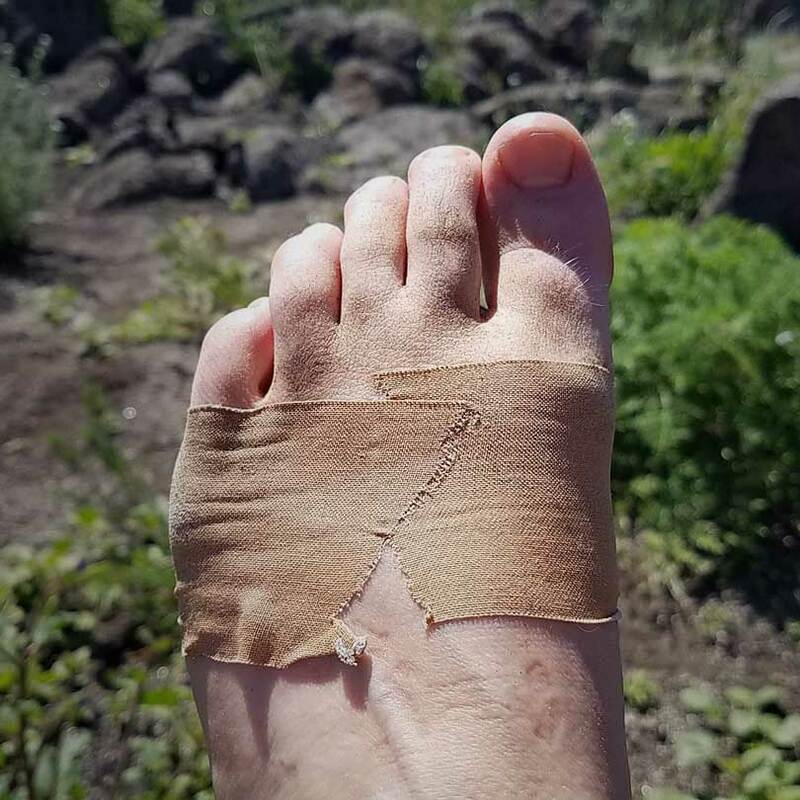 Most hikers swear by Leukotape these days. Leukotape is like a skin-colored athletic tape that has heat activated glue. Burnish it onto your skin and it becomes like a second layer of skin that will reduce friction wherever it is applied. I’ve doubled and tripled up with it for extreme problem areas. Be sure to keep your roll dry, as moisture causes the glue to transfer and will make the tape less effective. Replace sock. Regardless what you find when you examine the forming hotspot, you should take the opportunity to replace your socks with a fresh dry pair. Simply removing moisture will go a long way to fending off blisters. 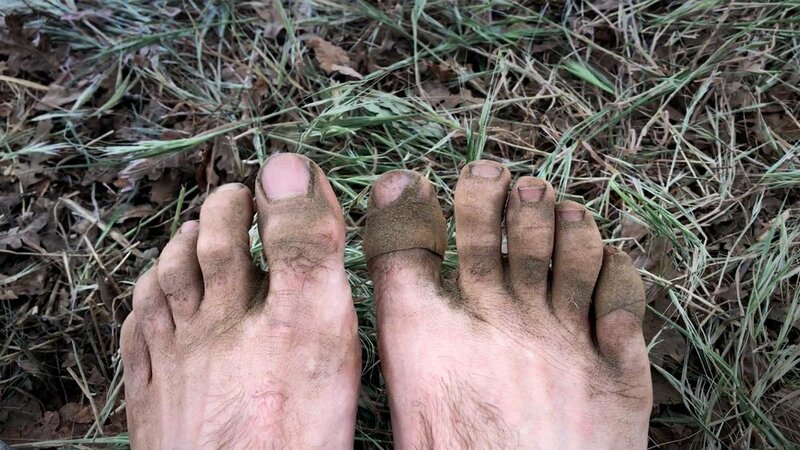 Now that you know what causes blisters and how to choose and select your footwear, you’re ready to gear-up, get out on the trail and put the tips about hygiene and hotspots to good use. Do you have a killer blister prevention tip I missed? Or want to share how these tips worked for you? Leave a comment below.